Arent you bored of eating the same old salty French fries all the time? If you are looking at a healthy alternative to French fries, then sweet potato fries is the best deal. Sweet potatoes have low glycemic index as compared to white potatoes, plus if you bake them, they may prove to be better versions of fries. And no, it won't hamper the taste; it will only get better. Anything grilled is tasty, and when it is grilled potato fries, you wouldn't want to miss snacking on it. 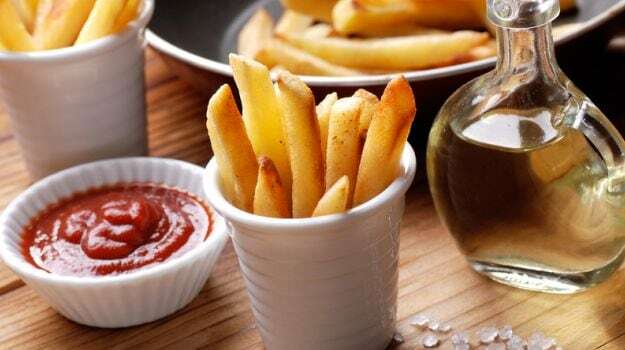 Adding some seasonings of your choice will definitely make the grilled fries flavoursome. These crispy delights are bound to leave you asking for more. What's better than fries loaded with lots and lots of cheese? Too guilty of frying and eating them with cheese? Bake them instead. The best part about baking them is that it does not affect the taste so you do not have to worry about it. In fact it is crispier and a healthy alternative. Poutine is a Canadian dish made with French fries smothered in cheese curds or mozzarella cheese, and topped with some brown curry. Mouthwatering much? Well, that's what poutine does to you. The idea of a perfect poutine is to have crispy fries and when the gravy hits them, they absorb the flavour and create a resilient texture. Peri Peri mix is spicy, flavoursome and tastes mega awesome with a pack of fries. The western masala can bring boring fries to life. Add on some smoked paprika, dried coriander, oregano, chilli flakes, salt and others seasonings of your choice to make it your way, and then sprinkle some on the platter and voila! Your Peri Peri fries are ready to be eaten. Indians have a knack of adding a twist to certain foods and that's how we love it. If you are an ardent lover of Butter Chicken, then don't hesitate to spread some of it on your fries to experience the best of both worlds. So what's all the waiting for, load up on Butter Chicken and gorge on to it without any regret! The best thing about bacon is you can have it in any form. How about sprinkling some bacon pieces on cheesy fries and making it amazingly delectable? If you haven't done it already, DIY at home and indulge! Change is always good, so why not try avocado fries instead. If you are tired of eating potato fries, switch over to a healthier option. The crunchy and creamy texture of avocados is to die for. Bake them instead of frying, so as to keep them healthy without really loading up on too many calories. I have heard somebody say, 'happiness comes in various shapes and sizes', looks like they meant waffle fries. Waffle fries can come in varying sizes and we are not complaining. They are just like waffle, but made out of potatoes and baked. They can be super-thin and stuffed as per your liking. Potato wedges are a bigger and better version of French fries. They are baked delights seasoned with Parmesan, onion powder, garlic powder, pepper, salt and a few drops of oil. What's not to love? Make it at home and enjoy snacking while you watch your favourite shows or movies. Do let us know which one tops your list and which one would you love to try making at home!